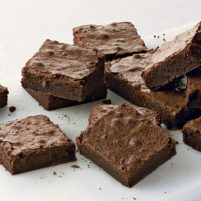 Not wanting to make a trip to the store, a mom used her breast milk to make brownies for a school bake sale. After other moms found out and expressed their disgust, the anonymous baker shared her story on Facebook. The baker wrote that another parent found out about the secret ingredient and was “blowing it way out of proportion.” She then asked for advice on social media and received more than 1,000 comments, mostly negative. Cow milk good; human milk bad. The diary industry want to make sure this does not happen again. I’m glad we could take time out of our day to read such a worthless story. Our world is war torn, our nation rocked by unending political scandals, our state is catching fire, and I’m supposed to find time to care about breast milk in brownies? This is between that lady and whoever ate those brownies. Oh, really? She made those brownies for a bake sale. A public bake SALE. 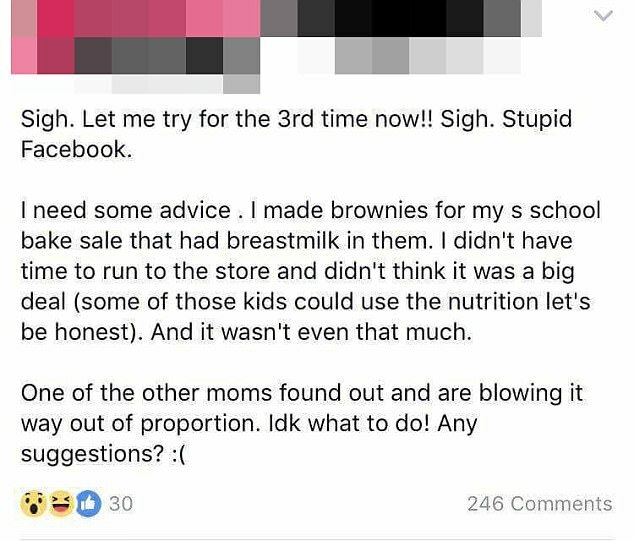 Did she advise those persons who were considering buying those brownies of the milk that she used to make them? Oh My God…..I will never eat brownies again. Thanks a lot. Wait this was a bake sale, were the buyers contacted? I don’t know but there seems to be tons of recipes out there that use breast milk instead of the bovine type. The heat involved with cooking kills bacteria, germs and viruses and that’s why restaurants have cook and holds temps’ (160 degrees F to cook and 140 degrees F to hold). Bovine milk is “pasteurized” which is a heat based process (161 degrees for about 15 or 20 seconds?) with the intent to kill all bacteria, viruses and or germs. So cooking brownies at say 350 degrees F would surely kill any naturally occurring bad stuff. I’d be more worried about the cleanliness of the mothers hands then her breast milk. No time to go to the store, but time to pump a quart of breast milk. The apocalypse is officially upon us. A quart?! How many brownies did this women make? Was it bake sale for Hostess? Now let me add to the hysteria…. Milk is not necessary for homemade brownies (their suppose to be chewy not fluffy) and I couldn’t find one boxed mix that calls for milk (no, I didn’t spend a lot of time on that one and relied mostly on personal experience); as a replacement for water yes, but as the primary “wet” ingredient no (oil, eggs and water). Now there’s the question that begs to be answered; why milk?! Of any kind? Oooooops! The plot thickens…. It was sarcasm. I wish they had a special font for that for rams fans. OK, first, lets remove the picture in our minds that we all have of a sweet innocent baby nursing at it’s loving, nurturing mother’s breast. And, PLEASE, let us set aside the current political weapons of sexism & misogyny. Breast milk is a bodily fluid.How appropriate do you think it is that people put bodily fluids in bake sale items? I believe there are laws against this. “Breast milk is a bodily fluid” One question where do you think cow’s milk comes from? Cow’s milk is also bodily fluid, and even more so it is also breast milk. That aside, it is also processed for our protection, I’m not thinking this person did the same with her milk. Next time it will be pot brownies. “I didn’t have any vegetable oil in the house, and I promised I’d bring brownies, so I went ahead and used my stash of hash oil. (some of those kids could use a little mellowing out, let’s be honest)”. Fear mongering? You won’t say that when nuclear brownies arrive at your next potluck. I’ve had nuclear brownies! They’re the BOMB!!!!! You sound a little…. paranoid. How dry is your mouth right now? C’mon, what’s with all the thumbs down? Everyone knows breastmilk is a gateway ingredient.